One third of the regular season completed, 12 games, and it is not even Thanksgiving yet. The Bulldogs embark on the second portion of their schedule continuing with NCHC play in Omaha who has only played eight games overall this season. Slowish start in net, but Kaskisuo is now the backstop that an elite team needs. McNeely an afterthought as of now. On the PK too often staying securely in the top five in the nation for penalty minutes. But the SHGs are coming in with five so far. Dom Toninato is on fire scoring with nine goals so far. What follows that stat is good team scoring, three players with four goals and 16 players with at least one goal so far. Andy Welinski becoming elite defenseman and leading a very impressive defense corps. As a squad, the defense is giving Kaskisuo the support he needs to be his best. Picks by @afiskness. The Bulldogs have found their balance and have used that to put in a 5 game winning streak. Last weekends effort was impressive versus the Gophers. The three penalties in the Friday game played a huge part in the Bulldogs dominance. Now of course Bulldog fans need to worry about a let down. The team play is strong this season and if the Bulldogs stay out of the box they can continue this winning streak. 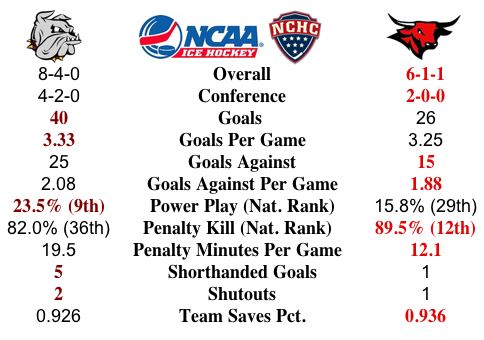 Minnesota Duluth @ Nebraska Omaha: This is a great series as both goalies are on fire. The Mavericks at home get an edge, but the Bulldogs play good on the road. Split. Western Michigan @ Miami: The Redhawks managed a nice Split in Grand Forks last weekend and have shown so far that they should be a real contender. The Broncos have had a slow start this season and it won't be easy to win in Oxford this weekend. Miami sweep. North Dakota @ St Cloud State: North Dakota goes on the road to the play a Huskies team that appears to have bounced back after being swept at home two weeks ago. Special teams will likely be the difference in this series. Split. Air Force @ Denver, Wisconsin @ Denver: Denver is the favorite in both games and I think Air Force has the better chance for the upset then the Badgers. Denver two wins. Wisconsin @ Colorado College, Colorado College @ Air Force: It has been a tough season so far for the Tigers with their only wins this season coming against the Chargers. Thankfully for them this weekends matchups are in their favor. The Tigers should get two wins, but I think the Badgers find their first win of the season on Friday. Saturday night the Tigers bounce back and beat the Falcons. Last weekend was the first sweep of the season and the first at Saint Cloud since 1999. Follow that up now with the UMTC Gophers and their #1 ranking in the country and you have a tall task. The home-and-home series will mark the first meeting in Duluth since October of 2011 even though the teams have played the last two seasons. First up UMD will be on the road unlike their previous home-and-home series this season against Minnesota State Mankato. Picks by @afiskness: The Bulldogs were impressive last weekend in the sweep at St. Cloud. The goal tending and defense are playing really strong while the team continues to put up goals. Team discipline still concerns me though as the Bulldogs continue to take bad penalties and too many penalties. St Cloud State @ Western Michigan: The Huskies are licking their wounds after being swept at home last weekend but they are now on the road against the Broncos who have played better in recent weeks. Split. Miami @ North Dakota: This is a great matchup in Grand Forks. Injuries have hit North Dakota so a home sweep is out of the question, but they are stocked with enough talent to split with the Redhawks. Colorado College @ Denver: This is the first game for the Gold Pan. The Tigers are out matched on the road, Pioneers win. Minnesota Duluth vs. Minnesota Twin Cites: The ranked opponents continues for the Bulldogs. 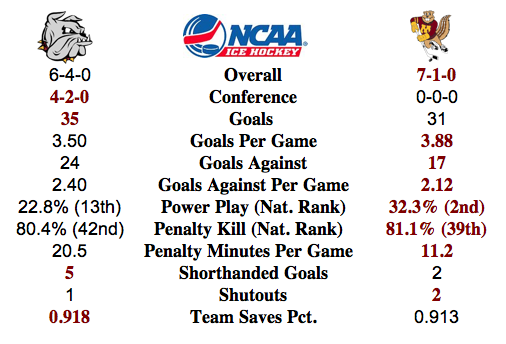 UMD will need much better goal tending than the first time these two teams met, which they have been getting recently. This series has split written all over it. Last weekend, another split with the Friday loss and second night win streak still alive. On the bright side, the Bulldogs broke their streak of major penalties in a game with Saturday night's 4-3 win. The splitting has been bemoaned here, but in reality, UMD is facing good opponents. But if the Bulldogs want to take it up a notch there has to be a better than a split here soon. And hopefully in NCHC play. The confines of the cement sarcophagus, AKA the Herb Brooks National Hockey Center, has not been kind to the Bulldogs. Ever. This would be a good weekend to do better than a split, but likely they will be trying to maintain their split streak. Picks by @afiskness. Another weekend passed and the Bulldogs ended up with the same results as the previous weeks. This week's games against the Huskies won't be any easier than the previous weeks, so a split might be a good outcome. I would really would like to see the Bulldogs win on Friday, that would be a great place to start. The goaltending is starting to look solid, more balanced play and the Bulldogs will be a strong playoff team. 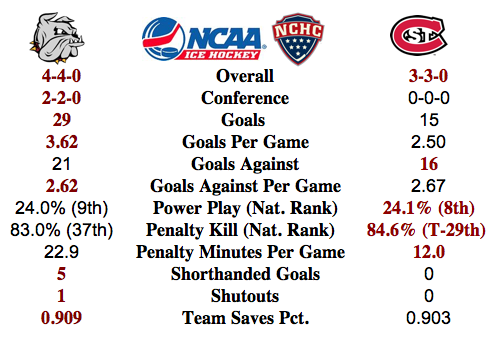 Minnesota Duluth @ St Cloud State: The series against ranked opponents continues for both teams. The Bulldogs need to find some discipline and take fewer penalties to keep the play even strength. I don't like the match up for the Bulldogs and think they must get a win Friday night to prevent a sweep. I will go with a Huskies win and tie. Colorado College @ Miami: The Tigers are on the road in Oxford, Ohio and it will not be easy for them to pick up points this weekend. Miami is a good team with a lot of scoring capability that doesn't give up when loosing. Redhawks sweep at home. Western Michigan @ Denver: The Pioneers have played well at home this which will make it difficult for the Broncos to pick up any league points. The Pioneers strong defense will lead to a sweep over the lackluster offense of the Broncos. Nebraska Omaha @ Ohio State: This series rekindles the CCHA rivals. The Mavericks are doing a good job scoring and have gotten good goaltending out of Ryan Massa. The Buckeyes have been inconsistent but they hope to be a contender in the Bi6 Ten. Results will be a split. North Dakota @ Wisconsin: North Dakota travels to Madison to resume this WCHA rivalry. The Badgers have only played four games this season and haven't looked very good in those games. Meanwhile North Dakota is putting up wins with a strong start to the season. North Dakota win and tie.